But Sanders is intentionally making a straight up, outright lie when he talks about the changing share of corporate taxes. Politifact, the NY Times, the IRS, the Congressional Research Service, the Congressional Budget Office, Factcheck.org and the Center on Budget Priorities all recognize the problem with these statements. Due to the creations of Subchapter S corporations after 1958, much – perhaps most – corporate income now flows through to individuals who pay individual taxes. Moving the profits from the corporation to the individual shareholders resulted in reduced corporate taxes and increased individual taxes. Taxes are still paid, but by the shareholder/owner rather than the corporate entity. Because of this, we cannot compare the tax numbers in 1952 to today – they are not comparing the same items. Goebbels once wrote that the most effective propaganda contains only true statements, yet guides the target to the desired conclusion. This is one of several examples this web site will use to show how a sequence of true statements can lead the viewer to a false conclusion. Click through to read the full background and how Bernie Sanders is cleverly telling a lie to further his message. The poster was shared into my Facebook news feed in 2015. When I began to look at the numbers, I assumed the poster was true. Much to my surprise, the logical conclusion is not true. The poster is, in effect, a lie, that relies on lack of knowledge about tax history in order to work. In 1958, Congress established the S Corporation (“S” refers to subchapter S of chapter 1 of the IRS Code.). Prior to 1958, businesses used the traditional “C” corporate form. In the “C” corporate form, corporations directly pay taxes on their income. In an S corporation, the corporation pays no taxes but passes all profits through to the shareholders, who then pay the tax owed as part of their individual tax assessment. Large numbers of C corporations converted to S corporations – reducing the tax paid by “corporations” while increasing the tax paid by individuals. From a propaganda perspective, this poster is outstanding – like good propaganda, it makes a true statement that leads the viewer to a false conclusion. The message sounds plausible and the viewer will not question its accuracy. In addition, the Sander’s poster rounds the numbers in favorable directions for his point. The actual figure of 9.9% was rounded by Sanders to 9%. And the actual figure of 32.1% was rounded up to 33%. But these are not the big problem with this poster. More critically, Politifact notes many “C Corporations” are now “S-Corporations”. A major difference is that C Corporations pay corporate taxes on their profits, while S Corporations pass their profits through to the owners/shareholders, who then pay the tax as an individual income tax. This has the direct effect of shifting “Corporate taxes” (of 1952) to “individual taxes” of 2014, even though its the same tax money. The effect is to decrease the measured “corporate tax” and increase the “individual tax” collected metrics. S Corporations and other non-C type business forms are popular for small businesses and account for up to half or more of total corporate income today. Even large corporations are Subchapter S corporations. For example, Bechtel is the largest construction and civil engineering firm in the U.S., but it is registered as a Subchapter S Corporation. Its profits flow through to individuals who then pay the taxes on their individual returns and these taxes are not included in the “corporate taxes” metric. The S Corporation did not exist until 1958, which is another reason using 1952 is cherry picking the date for comparison. Source http://fas.org/sgp/crs/misc/R42726.pdf – Report of the Congressional Research Service, Dec 1, 2014, www.crs.gov. In this context, “business income” is how the CBO tracked the transfer of business derived income from C Corporations to S Corporations. In plain English, as more businesses went from C Corporation structures to S Corporation structures, the “Corporate” income tax went down and the individual income tax collected went up. “When Sanders compares 1953 corporate taxes to today, he’s leaving out information about how businesses paid taxes back in 1953 and how they pay taxes now. A greater percentage are now taxed at the individual level through owners, a trend that has occurred largely since the early 1980s. Media often fails to understand this distinction and reports that corporate income taxes have disappeared – see https://finance.yahoo.com/news/corporate-taxes-10-percent-federal-015650314.html The author makes this vague reference: “The decline is the result of the rise of untraditional business structures...” Heh, no kidding. “Only 6 percent of businesses are traditional corporations subject to the corporate income tax, according to the Congressional Research Service. That is down from 17 percent in 1980. The result is less than half of the government’s business income comes from corporations, down from about 80 percent in 1980. And while most S-corporations are small to midsize businesses, as was intended, some of the country’s largest private companies, including Bechtel, one of the country’s largest engineering firms, are also organized as S-corporations. The NY Times acknowledges we’ve moved corporate taxes from the corporate tax column to the individual tax column. The government still collects those taxes on corporate income but now counts them as individual tax collections. In 1986, 1/4th of US corporations were Chapter S corporations. In 1997, 1/2 of US corporations were Chapter S corporations. In 2001, Chapter S corporations accounted for 25% of before-tax profits. Tax deferred retirement accounts were introduced in the 1980s and the investment income within those accounts was not counted as personal income, also skewing the income tax ratios. This poster is technically true – but like good propaganda, leaves out critical details. There are reasons to debate the amount of taxes paid by corporations, businesses and individuals, and their use of tax dodges. But this data point – the drop from 32% to 10% – is intentionally misleading, perhaps half or more of the drop is an accounting change that moved business taxes from C corps to S corps that appear on individual returns, thereby decreasing the C “corporate taxes” while simultaneously increasing individual tax collected. Afterword: When I began to research this item, I thought it was going to be entirely true. 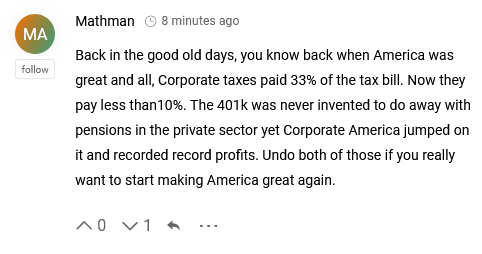 I had not realized the S Corporation structure was created in 1958, and that today most corporate income has migrated to individual income categories, rendering this comparison useless. Certainly there remain many corporate “tax dodges” and tax reduction schemes and it is fair to question those. 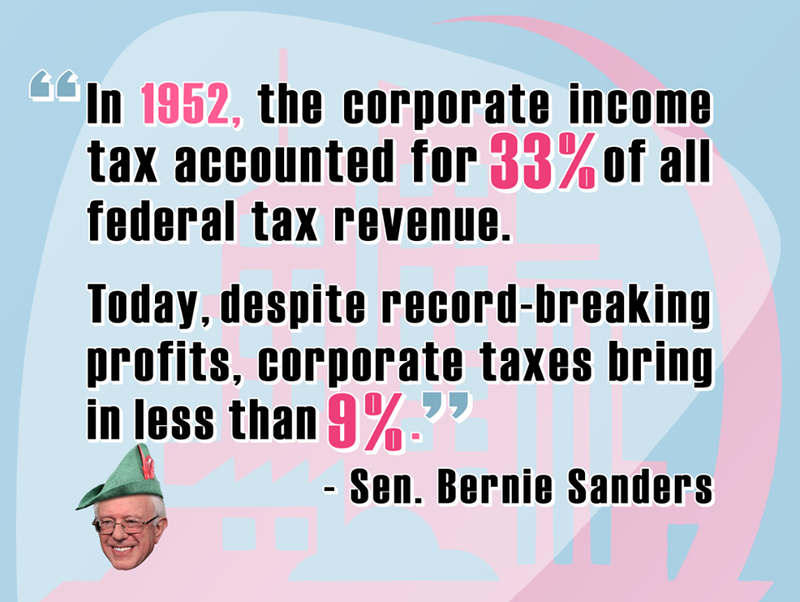 But to directly compare “corporate taxes” in 1952 to today is deliberately and intentionally misleading. The use of this propaganda poster by the Sanders campaign is not a positive one for Sanders, once you know about the C to S Chapter conversion and the impact that had on taxes. This poster was carefully designed to accomplish its goal of guiding the viewer to a false conclusion; this is by design and is not an accident. Sanders is intentionally making a straight up, outright lie when he talks about the changing share of corporate taxes. The media – and social media posts – routinely leave out context and historical background. Extensive pre-propaganda has been asserting that “corporations no longer pay their fair share”. After an onslaught of stories that corporations do not pay taxes or do not pay “their fair share”, the numbers presented seem plausible. The use of historical numbers – without context – lends authenticity to the claim. Numbers always lend authority to any claim, even if wrong. In the mind of the target, the claim being made is plausible and therefore is true. Even though the intended conclusion from the poster is not true, this poster is extremely effective as propaganda. In March of 2019, an Oregonian news story had a story about pension issues in Oregon. A comment to that story regurgitated Sanders’ false claim, illustrating how propaganda messaging essentially creates “facts” out of thin air that live forever.